you do sometimes find what you're looking for, even if it takes a little longer than expected to find it. just after christmas my mom had to pick up some jewelry she'd sent out for repair and i finally took a minute to get the thing looked at. apparently i hadn't just broken the prong, i'd chipped the diamond. who even knew!? diamonds... fault lines... i got a proper scolding for wearing it while broken and a repair estimate that nearly knocked my socks off. i'm sure i gave her a real beauty of a "whaaaaaaat?!" face. it felt like a good one, anyway. we scoured the internet for weeks before finally stumbling upon OaksBoutique on etsy. jackpot. gorgeous selection, and really fair prices. here's a tiny bit of detail the ring--she's got a 14k yellow gold filigree band with a little over a carat weight of hand-cut diamonds set in white gold. really divine filigree work in that white gold, too. if she were to have a name she'd have to be called estelle. but who names their wedding ring? oh swoon, etsy. swooooon. (imagine the damage i could have accomplished if etsy and pinterest were around when i was planning my wedding. that is a truly, truly frightening thought.) for now we're tucking our sweet broken engagement ring away for another "someday," when we'll dream up something fitting to do with her. she'll always be so special to me, i couldn't possibly hide her away for too long. oh hey, brandon! i do! again! This is just so gorgeous. Also, re: the old ring, if you're in need of ideas, my mom had her mother's engagement ring reset into a pendant with my brother and I's birthstones via a jeweler friend, and it turned out really lovely and dear. So, so beautiful. What an absolute gem (and yes, pun absolutely intended). It is such a gorgeous ring! I never looked at any like this before, but it makes me want one! So classy & vintage. Timeless. 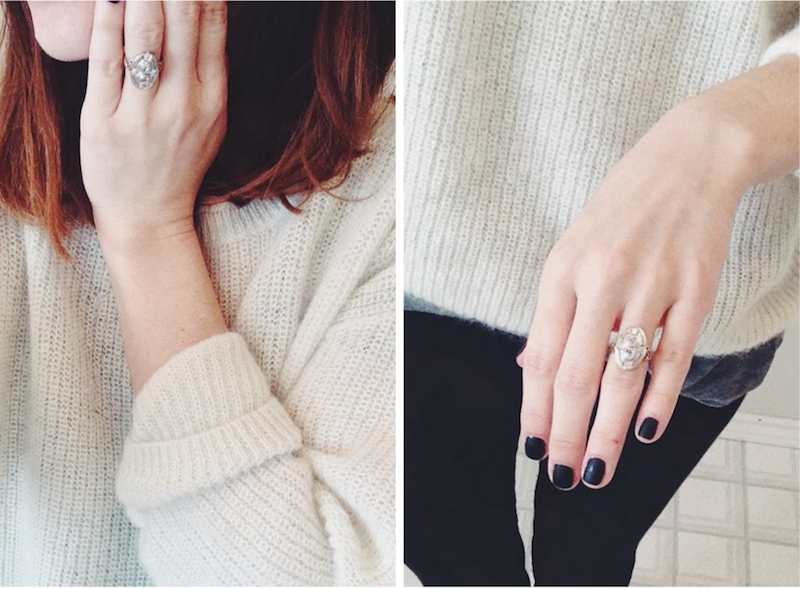 This post says it all "I love my engament ring, but I never really loved my engagement ring." I've just bent my engagement ring into some absurd shape and it's a fortune to repair. Maybe I'll go this route too! Oh it is a pretty ring!! Very unique looking! That thing is a beaut. TDF!! so sweet! i am glad you finally got what you were looking for! i also want to change my ring, but i want to go smaller. is that weird? maybe someday. She is stunning! So happy that you found her! It is lovely!!!! I know what you mean about always wanting antique rings. I have estate rings. My engagement band is from the 20's and my wedding bands are from like 1900. I love them because the bands aren't the same and they are flat so they don't fit against my engagement ring. He did really well. They are platinum with the filigree and scroll work and hand cut stones. Estate and antique jewelry is like art. They just don't make them like they used to do they? Hey I totally agree with you, each piece of estate and antique jewelry is a piece of art! I love unique wedding rings! Mine is actually a black diamond. There is nothing like having the thing you wear on your finger every day be a total representation of your personality. Cheers to a really great ring! jackpot is RIGHT! congratulations on finally finding your perfect ring. i love that brandon is excited too. hehe. i.love.it! my diamond is actually from the 1940s and my guy bought a new setting and we had it placed since she passed away. it was a little way to include her in my wedding since she is no longer with us on this earth. I have a vintage 1920s ring too and i couldn't love it more. P.S. 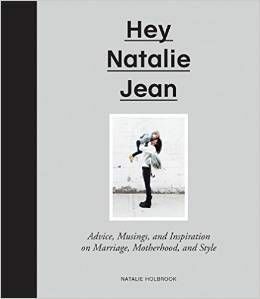 you dont wear your wedding ring with your engagement ring I noticed - is that an american thing or a Natalie thing? OMG. That ring. It's freaking PERFECTION. So gorgeous! We recently upgraded my ring as well.... but we've been married 4 months (insert a gasping emoji here because that's not long at all..) But here's the deal: my first engagement ring was absolute perfection. Like, insane dream ring. It belonged to my great grandmother, from the 1930s. It is yellow and white gold, with the tiniest of diamonds in the center. Like, tiny. I'm no diamond gal, so that was a-okay with me. However, the band was so worn that it was too thin for every day wear (seeing as it was 70+ years old, and I had already been wearing it for 20 odd months straight). So we "upgraded" for the time being to a white topaz/white sapphire ring. Sigh. That IS So Beautiful!!!!! It looks so Perfect on you that it's hard to imagine what the other ring looked like on you. Gorgeous! My kind of loved ring as well: 1920's + filigree... it is sweet! I am single but I wanted a bit of spark to cheer my everyday. lol. And yes, saint Etsy saved me as well, but I chose moissanite instead and let me tell you it is sparkly!! That is a beautiful ring! It seems to fit your personality so well. I remember admiring your engagement ring before & trying to figure out what it looked like so it's cool to see this one up close. Aw, I'm sorry to hear that your broke your engagement ring but I guess since it wasn't always your dream this was a win win! Can't wait to see what you end up doing with the old one! This ring is beautiful!! Hi: love your fairy jewellery I'd love a tutorial on Elven Star I actually have been wanting a tutorial thereon vogue ever since I actually have seen it.wedding jewelry I will create the wire half simply do not know a way to do the remainder lol.